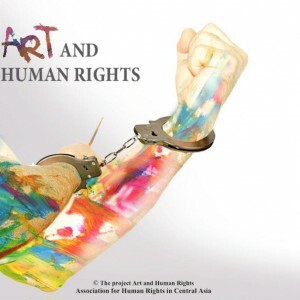 «Art and Human Rights» – project of the Association for Human Rights in Central Asia, created by the artists from Central Asian countries in 2011. While the authorities of the former Soviet Republics continue to violate the freedom of expression the artists are in danger for presenting their works that show the essence of the despotic regimes and violations of human rights. For this the artists face prison terms, torture, and limitation of freedom of movement. Authorities control Internet activities of artists, their communications with foreign diplomats, independent journalists and human rights activists. That is why the purpose of the project «Art and Human Rights» is to promote work of free artists, inform the public about the conditions in which they struggle for their independence, provide legal support for them and find donors to support their activity. We would like to introduce to you the art works of these artists. Participants of the project prepared a series of works based on letters from prisoners, which can be found. Series of political posters on human rights violations and corruption. At the same time, project participants are creating an archive of items and documents for a mobile exhibition on human rights violation in Central Asia. Works of our artists were used by mass media, international and human rights organizations in their reports, events or during actions in defense of human rights. Among them are «Amnesty International» (AI), «Human Rights Watch», «International Partnership for Human Rights» (IPHR), «Norwegian Helsinki Committee» (NHC) and others. To continue this activity the project «Art and Human Rights» needs donors.